The National Football League has undergone a long period of controversy ever since ex-QB Colin Kaepernick kneeled during the National Anthem as a protest. 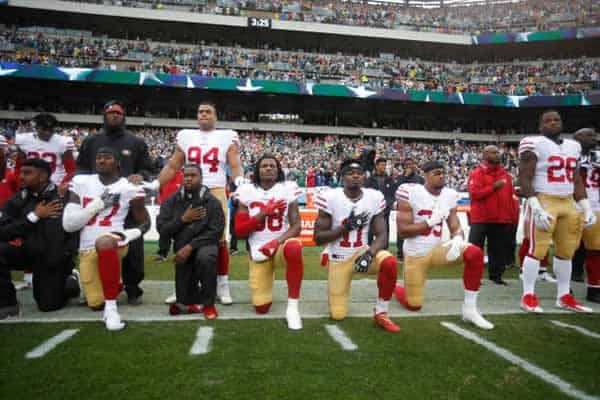 More and more players began kneeling in protest against what they believe is wrongful treatment against African Americans by law enforcement around the country, drawing ire from sponsors, some fans and even the President of the United States. To stop this, NFL owners recently approved a policy that demands players on the field must stand during the National Anthem. If a player kneels, that player and the team they play for will be fined. Players have the option of staying in the locker room during the National Anthem. This at least gives them the option to not stand for something they do not believe in. Some players have already begun discussing alternative ways to protest that land outside this new rule. The policy change has been met with mixed reviews. President Trump heralded owners for making the call. There are rumors that Trump himself pressured owners into making the decision. He has expressed his disagreement with players kneeling on multiple occasions through his Twitter account. In an interview with Fox and Friends, Trump stated that it was a “good” decision and that he believes players should not have the option to remain in the locker room. Vice President Mike Pence also expressed his support via Twitter with a screenshot of an article breaking the news along with #winning. Other people see this rule is an infringement of personal rights as citizens. By forcing players who want to protest to remain in the locker room, some believe the NFL is muting their voices and trying to remove their cause from the limelight. The NFL Players Association was quick to fire back with a statement of their own. They wrote that the league never consulted them on this policy change and it actually contradicts statements made to the NFLPA by Commissioner Roger Goodell and the NFL’s Management Council John Mara. The NFLPA said they will challenge any part of the new rule that violates their collective bargaining agreement. With several months before the season begins, it is unknown whether this rule will hold up. In all likelihood, the rule will stand and players will have to adopt the new policy or risk fines. NFL viewership has been on the decline the past several seasons and some believe the kneeling is a part of it. By that logic, this policy will hopefully bring back some of the viewers and therefore boost sponsorship and advertising revenue. The interesting part is that the whole players kneeling issue had died down a bit towards the end of this season. This move thrusts it back into the spotlight and will lead to weeks if not months of debate. If the NFL was trying to brush this under the rug, they failed. Perhaps they feel that addressing it early on will be better when the new season finally kicks off.